Here, Director of Ship Operations Al Suchy describes how the A-frame on the research vessel Atlantis was upgraded to handle the new, bigger Alvin. Behind me, at the stern of the Atlantis, is the Alvin Launch and Recovery System, or LARS. We call it the A-frame. The original thinking by some was that nothing would have to be done to the LARS with the new submarine. And if there was, it was going to be very, very minor. But it turned out to be a significant project for a number of reasons. The original A-frame was rated to 40,000 pounds and the old Alvin weighed approximately 36,000 pounds. We didn’t know at the start how heavy the new Alvin was going to be. It’s not a fair question to ask the Alvin project team for a final exact weight before their design and manufacturing process is complete. But how do you modify the ship to take on something that hasn’t been built yet or even finally designed yet? So we said, ‘there are various levels—45-, 50-, 55-, 60,000 pounds—we could design the LARS to. We can reasonably go to 50,000 pounds; can you build a submarine that is within 50,000 pounds?’ And they said yes. And they did. If we had waited to know what the final weight was, we would have just started in May . The upgrade involved new safety and performance requirements that had not been imposed when the system was built back in 1983. It is likely that even if the new sub came in under 40,000 pounds, we were still going to have to do some modifications because of new certification requirements. These mainly had to do with accelerations of the load. Moving the A-frame in a confused seaway, where now you get a wave, now you pitch, then you roll, and the ship shakes, and you’re trying to handle the submarine in this dynamic environment—that kind of ‘shock-loading’ was a big concern. The A-frame part of the system was overhauled in early 2011 at BAE Shipyard in Florida. We beefed up the structure at the lower part of the A-frame—thicker steel plate sections, with more reinforcements—and we put in new cylinders that move the A-frame out over the water. In late 2011 the swinging beam was sent to Caley Ocean Systems in Scotland for upgrade. We got this gargantuan lift winch, which is much larger than the previous one, installed along with many other changes. It did not return until mid-2012. The pipes along the outside of the A-frame carry hydraulic fluid. We upgraded the main hydraulic power unit, which is down a deck below this. Two huge electric motors drive two pumps that provide the hydraulic flow to move all the components within the system. The sheer size and complexity of this system increase the cost of operating Atlantis. There is no comparison to the Alvin LARS within the entire U.S. research fleet. My normal responsibilities are all things pertaining to all WHOI ships—crewing, budgets, ensuring that we’re doing everything safely and in an affordable way. So to get the A-frame upgrade and certification all done, too, it was pretty much working 16- to 18-hour days, week after week after week. 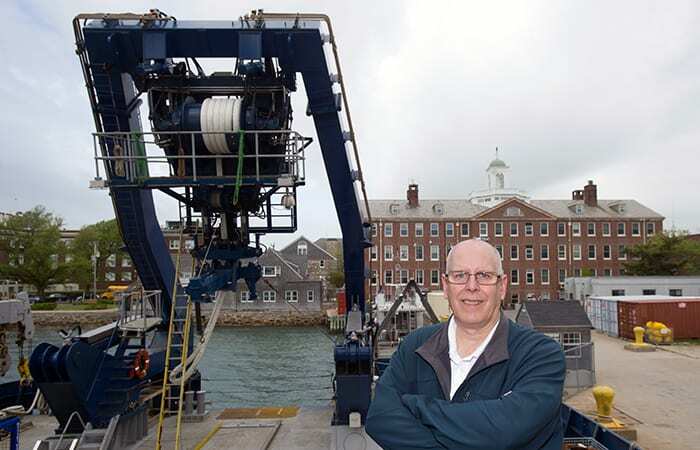 I came to this job at WHOI in March of 2003. I had been in the Coast Guard for 26 years and at Intel Corporation for three years prior to that. It’s been an interesting 10 years, that’s for sure.